Arriving in time for 2011’s Year of Alabama Music celebration, C.S. Fuqua’s Alabama Musicians: Musical Heritage from the Heart of Dixie is an encyclopedic journey through the cotton fields, church houses, and roadhouses of Alabama. All of the biggies are here—Hank Williams, Emmylou Harris, Erskine Hawkins, three-fifths of the Temptations, Sam Phillips—with extensive biographies detailing their lives and work. Other, lesser-known artists are also included—Azure Ray (Maria Taylor and Orenda Fink), Coot Grant, Ray Reach, Ray “Dr. Hook” Sawyer. The book also includes biographies of two-thirds of Alabama’s American Idol winners/runner-up. More on that later. 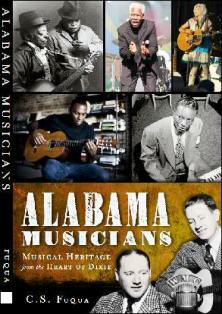 Alabama Musicians is divided into three sections: Alabama’s Contribution to Music, Biographies, and And More: Mini-biographies. The latter two sections are self-explanatory, including bios of artists in every genre of music imaginable—folk, blues, country, gospel, shape-note, jazz, classical, soul, and rock ’n’ roll. And, yes, the book includes photographs and a selected bibliography. Not surprisingly, Fuqua devotes much ink to the Shoals area, Alabama’s renowned music Mecca. Readers learn here that the area’s recording industry began not with Rick Hall at the Florence Alabama Music Enterprises (FAME) recording studio, but with Dexter Johnson’s converted garage. Although Johnson produced no hit records, Fuqua credits him with getting the industry rolling. FAME, of course, brought international, well, fame to Florence with the release of Arthur Alexander’s “You Better Move On.” Hits by Tommy Roe, The Tams, and Percy Sledge followed. Then Atlantic Records’ Jerry Wexler came to town, bringing with him “Wicked” Wilson Pickett and later Aretha Franklin. Soul was born and FAME was hot. The biographies—both long and short—contain a wealth of information about Alabama recording artists, songwriters, and producers, famous and almost famous. There are some notable absences of well-known—sometimes superstar—Alabama musicians, though. Jimmy Buffett is not here. Neither is Tammy Wynette. Nor Johnny Shines. Fuqua explains, “The basic criterion for inclusion is that the artist, or at least a member of any included band, be a native Alabamian.” Buffett was born in Pascagoula, but spent his formative years in Mobile. Wynette was born in Itawamba County, Mississippi, but she began her career on the The Country Boy Eddy Show on WBRC-TV in Birmingham. Johnny Shines, born in Memphis, spent his final years near Tuscaloosa. They should be here. American Idol second season winner Ruben Studdard seems to be omitted on a technicality. He was born in Frankfurt, Germany, where his father served in the U.S. Army. When his father’s tour of duty ended, the family returned to Birmingham. Studdard should be in this book. As should be Donna Jean Godshaux (Sheffield; The Grateful Dead), Chuck Leavell (Birmingham; The Allman Brothers Band, The Rolling Stones, Sea Level), and Johnny Sandlin (Decatur; Capricorn Records producer). To his credit, Fuqua does recognize up-and-comers The Secret Sisters and The Civil Wars. Certainly, under Fuqua’s criterion, the second edition of Alabama Musicians will include The Band Perry (Mobile), Will Kimbrough (Mobile), and The Drive-by Truckers (Muscle Shoals Sound royalty). Danny Gamble is the communications director at the Alabama Writers’ Forum.